With the iPad, pins act like the pins you might place on a paper map to note routes or favorite locations. Also, pins are markers: A green pin marks a start location; a red pin marks search results; a pin you that drop yourself appears in a lovely purple; and a blue pin (referred to as the blue marker) marks your iPad’s current location. 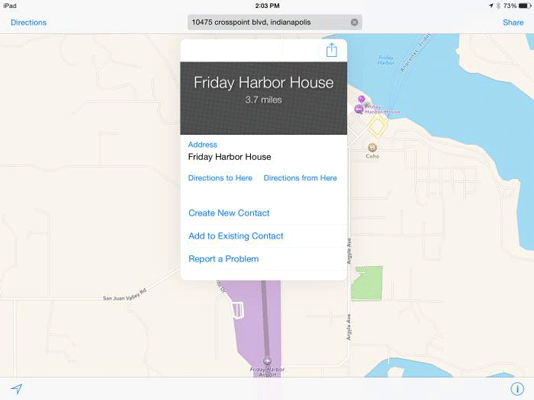 Display a map that contains a spot where you want to drop a pin to help you get directions to or from that site. If necessary, you can zoom in to a more detailed map to get a better view of the location you want to pin. Press and hold your finger on the screen at the location where you want to place the pin. The pin appears, together with an information bar. Tap the Information bar that appears when you tap a pin to display details about the pin location. 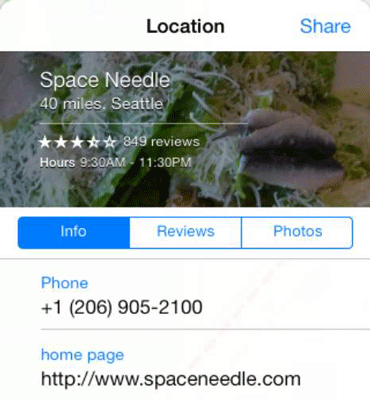 If a site has associated reviews on Yelp, you see a More Info on Yelp button in its Information dialog. Tap this button to install the Yelp app and read the reviews. If you like the destination, add it to your contacts to find it easily in the future.